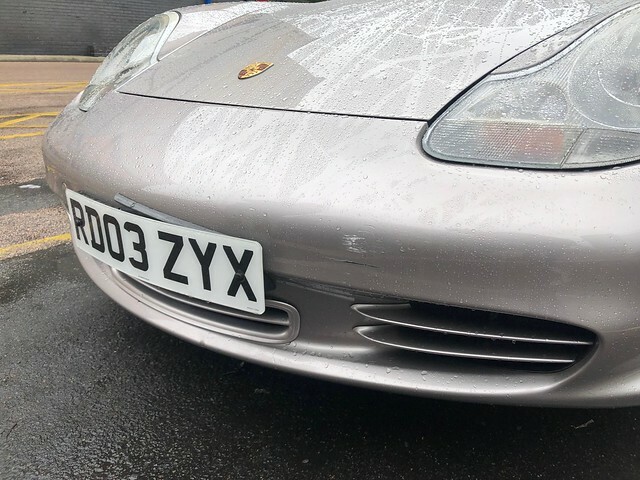 911uk.com - Porsche Forum : View topic - The Boxster Gamble - Should I? I did - Progress thread! 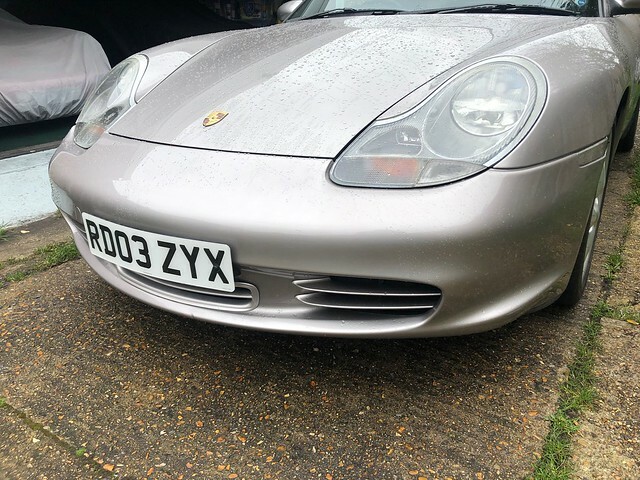 911uk.com Forum Index > Boxster (1997-) & Cayman inc GT4 (2005-) > The Boxster Gamble - Should I? I did - Progress thread! If the belt was jammed between the 2 pullys and still not going on then there is something wrong there .. sometimes the belt can catch on a bolt on the left side of the water pump so o/s .. have another go when you can but if no obvious points that its catching then i would have to go with the belt being a little short . Ive done countless belts over the years and the only problem ive had is wrong belt or the tensioner bolt slips .. i use a spanner .. bolt slipping is a pain as theres no access to get to the nut behind .. i think its a 15 mm spanner but trying to do it up .. mate .. i hate it . im just not strong enough .. embarresssing to have to get another guy to help .. but i have to . if no history then get it changed .. diy and its only the cost of the oil so pretty cheap. Still no luck on the belt, tried 2 others that a mate let me have from ECP to try, asked him to get me a proper Porsche one now. Oddly, 1 of the belts my mate got me was an Optibelt, the same people who make the Porsche ones. If the Porsche one won't slip on, I will just have to get a slightly bigger belt, I can't work out wtf is going on!! The original belt just slides straight on, no issues, all 3 of the others just won't go! I want to do the gearbox this weekend, I'm guessin it's just a 75/90 transaxle oil, gl4 or gl5 no issue? Nothing else going on at the moment apart from washing the car. 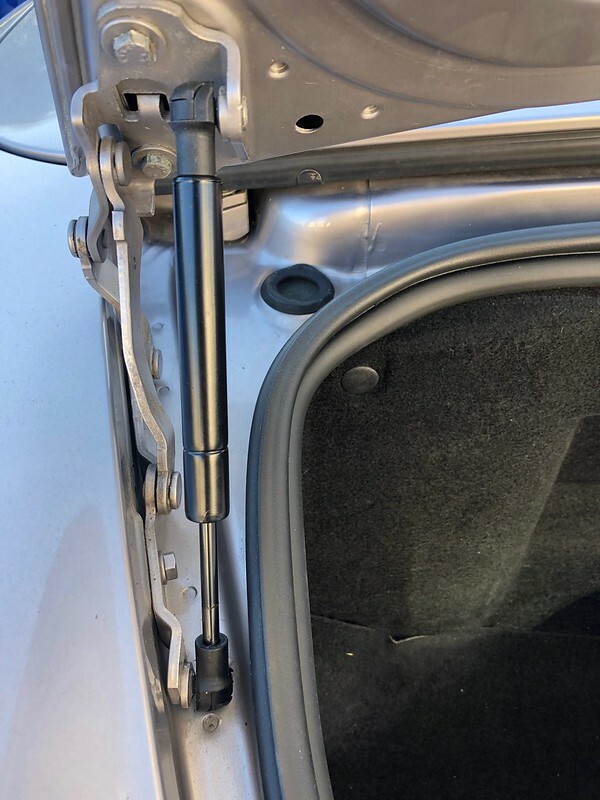 I did get some new decklid struts, the originals were failing to hold it up since it got cold. Not much going on here, the car is being used daily by the wife and it hasn't missed a beat, I enjoy taking it out, could do with more power but as a B lane basher, it's a superb car, had the opportunity to have the roof down the other morning and I did enjoy the run, the exhaust is slightly on the loud side but with the roof down on a spirited run, it did make me laugh! 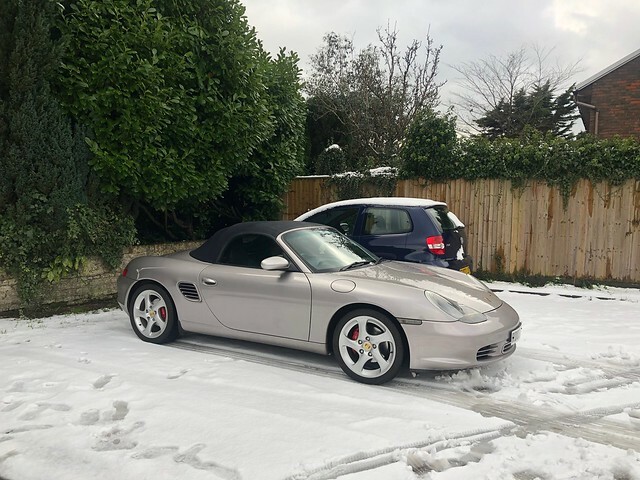 In colder times, it got us to the pub on a snowy day, it did however get stuck in this position as the snow turned to ice..
Not much in terms of new bits for it, everything works and feels in good order! A quick visit to get some paint from Halfords results in someone hitting the car, I was quite happy as there are some marks on the front bumper which are not bad enough to warrant having it repainted but ultimately, they shouldn't be there so I saw the knock as an opportunity to have it refreshed! The number plate plinth had split also. I got home and had a closer look at the damage and to my surprise, it all just wiped off!! 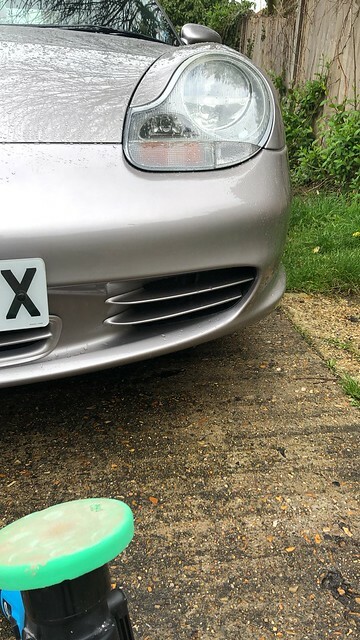 So now I'm back at the stage of, it's not bad enough to warrant the hassle of getting it redone, just this time I'm £300 better off, minus £19 for a new plinth. Having said that, the back bumper does need a paint, when the missus can go without it, I'll have that done. So far so good with this car, a brilliant car for what was an opportune purchase.